Vilhjamur Stefannsson was a man of note for several reasons. Born in Canada in the late 1800s, the would be explorer discovered new lands and continental shelves, all the while publishing a host of books, articles and journals. Between 1906 and 1918, he went on three expeditions into Canadian and Alaskan Arctic, with the duration of each trip varying from sixteen months to five years. During these years he observed the dietary habits of the local Inuits, whose primary food source was meat. In 1935 Stefannsson published his experiences in Harper’s Monthly over two articles detailing the all meat diet he encountered. Below is Stefannsson’s first article. In 1906 I went to the Arctic with the food tastes and beliefs of the average American. By 1918, after eleven years as an Eskimo among Eskimos, I had learned things which caused me to shed most of those beliefs. Ten years later I began to realize that what I had learned was going to influence materially the sciences of medicine and dietetics. However, what finally impressed the scientists and converted many during the last two or three years, was a series of confirmatory experiments upon myself and a colleague performed at Bellevue Hospital, New York City, under the supervision of a committee representing several universities and other organizations. 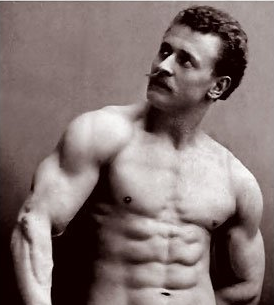 Attached below is Eugen Sandow’s classical book Strength and How to Obtain It. Whilst Sandow wrote a number of works, Strength and How to Obtain it was by far his most popular. Luckily for us in 2014, it’s also free to download and free to read. Find out Sandow’s measurements for the perfect body. Sandow’s tips for heavy weight training and even some great anecdotes from Sandow’s life. It’s a great book for the strength enthusiast and the physical culture historian alike. So go on, download it now and enjoy it for yourself!